Here is a dramatic reenactment of my current situation. Or at least, as long as it takes for amazon prime to deliver an intuos pen. AHAHAHAHAHAHA! Oh gosh my sides! xD That picture is too perfect! I have two of them, one of which I never use. Sorry to hear that man, those things aren't cheap. My dog chewed one up once, I would have sold the dog to replace it, but that still wouldn't have covered it. 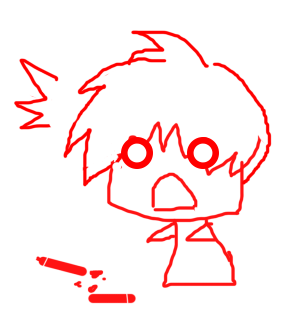 How-the-hell do you break a stylus pen ._. ??? Oh my. What a inconvenience turn of events. I hope your shipment will arrive soon. It's always bad and sad if equipment breaks suddenly. 70$ for a stylus O_o How could it cost so much? Well, you can always draw with mouse. It's pixel art after all. Mmm..not really. I go more than twice as fast when I have a stylus, so it makes more sense to do things I need to do anyway that don't require one. How does a stylus break? "Thus dawned the period where CGs were made with a mouse." Technically I could still sketch on paper, and ink with a mouse, but the coloring would be pretty mediocre. Always keeps a backup bamboo. Something tells me you broke the stylus out of frustration (may be talking from own experience) :D.
Oh well, it happens. Too bad it couldn't be just the tip. The pressure had been taking more to register for a while now, so I'm not surprised that it went after four years of daily use. Good thing it wasn't the tablet, Wacoms are expensive >_> good luck with Amazon! Uhm.., do you write with your left or right hand? Well, I tend to check my email every half hour so, no worries there. Well, unless I'm sleeping. In which case probably dreaming about being back in school and wondering why I'm there. Now, wouldn't it be a convenient if you had another artist?